2013 Haas VF-4 CNC Vertical Machining Center s/n 1106411 w/ Haas Controls, 40-Station Side Mount ATC, CAT-40 Taper Spindle, 8000 RPM, Haas Vector Drive, High Speed Machining, Advanced Tool Management, Rigid Tapping, Quick Code, Dual Side Chip Augers, Henning Chip Conveyor, Programmable Coolant and Air Blast, 18 ¾” x 52” Table, Hand Wheel, Front Mounted Tooling Storage Rack, 3994 “On” Hours, 793 “Cycle Start” Hours, 621 “Feed Cut” Hours. NOV 2003 Daewoo DMV 4020 “Diamond Series” 4-Axis CNC Vertical Machining Center s/n AV5E-1649 w/ Fanuc Series 21i-MB Controls, 24-Station Side Mount ATC, CAT-40 Taper Spindle, 8000 RPM, High Flow Coolant, Cooljet Filtration System, Turbo Chip Conveyor, 19 5/8” x 47 ¼” Table, Hand Wheel. 2003 Daewoo PUMA 2000SY Twin Spindle Live Turret CNC Turning Center s/n P200SY0202 w/ Fanuc Series 18i-TB Controls, Tool Presetter, 12-Station Live Turret, 4500 Main Spindle RPM, 6000 Sub Spindle RPM, 6000 Turret Tooling RPM, C-Axis (Main Spindle) 0.001 Degree Resolution, A-Axis (Sub Spindle) 0.001 Degree Resolution, Oriented and Synchronized Transfer Between Spindles, 8” 3-Jaw Power Chuck (Main Spindle),16C Collet Noses (Main and Sub Spindles), Parts Catcher, Turbo Chip Conveyor, Coolant. 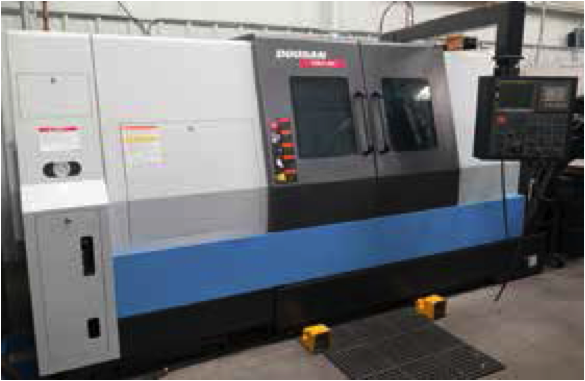 NOV 2011 Doosan PUMA-400 CNC Turning Center s/n ML0127-004474 w/ Doosan-Fanuc i-Series Controls, Tool Presetter, 6.6” Thru Spindle Bore, 12-Station Turret, Hydraulic Tailstock, 1500 RPM, Samchully MH-221 21” 3-Jaw Power Chuck, Chip Blaster mdl. F-75 300 PSI High Flow Coolant Unit s/n 0215 with Filtration Unit, LNS Turbo HB Chip Conveyor, Royal Filtermist mdl. DEC 2005 Haas SL-10 CHC Turning Center s/n 71989 w/ Haas Controls, Tool Presetter, 12-Station Turret, 6000 RPM, Hydraulic Tailstock, Rigid Tapping, M19 Spindle Orientation P & R Codes, 10mm Pitch Ball Screws, Quick Code, Haas Vector Drive, Parts Catcher, 16C Collet Nose, Chip Auger, Coolant. 1997 Akira-Seiki mdl. ASL-35 CNC Turning Center s/n 97268-010 w/ Mitsubishi 520ALR Controls, 12-Station, Turret, 45-4500 RPM, Hydraulic Tailstock, 10” 3-Jaw Power Chuck, 16C Collet Nose, Chip Conveyor, Coolant. Minster 6-Series Type G.T.O.B.I. 60 Ton OBI Stamping Press s/n 6G-17673 w/ Minster Controls, 90-Strokes/Min, 6” Stroke, 3” Slide Adjustment, 14” Shut Height, Pneumatic Clutch, Upper and Lower Knock-Out Pins, Triad Light Curtain, Level-Rite Press Mounts. M & N mdl. 1A200 Hobbing Type 200 Ton Press s/n 1743 w/ 8” Stroke, 8” Ram Cylinder, 14 ½” x 15” Between Posts. Rousselle No. 2G 16 Ton C-Frame Press s/n CG4636-64 w/ Rebuilt Slide, 11” x 16” Bolster. Wilder mdl. 1624 Sheet Metal Slitter s/n 40225. Benchmaster mdl. 182 5 Ton OBI Stamping Press s/n 54176. Hossfeld No.2 Universal Bender w/ ½” to 1 7/8” Bending Dies. Sharp mdl. LMV Vertical Mill s/n 10316985 w/ Acu-Rite Millmate DRO, 3Hp Motor, 60-4500 Dial Change RPM, Chrome Ways, Power Feed, 9” x 42” Table. Monarch 24” x 72” Geared Head Lathe s/n 37264 w/ 24-1000 RPM, Hydraulic Tracing Assembly, Inch Threading, Tailstock, Steady Rest, 12” 3-Jaw and 4-Jaw Chucks. (2)Traub mdl. A36 Automatic Screw Machines s/n’s A42-1201, A36-29 (FOR PARTS). 1991 Kent mdl. SGS-1020AHD 10” x 20” Automatic Hydraulic Surface Grinder s/n 900552-14 w/ Kent Controls, Kanetsu Fine-Line Electromagnetic Chuck, Wheel Dresser, Coolant Filtration Unit. Eldorado Gun Drill Sharpening Fixture w/ Pedestal Grinder and Diamond Wheel. Cuttermaster mdl. 5C Tool and Cutter Grinder s/n 17430 w/ 5C Air Fixture. Rockwell 1Hp 10” Pedestal Grinder. Dayton 6” Belt / 9” Disc Sander w/ Stand. Cincinnati EA and OM No.2 Grinding Wheel and Reg Wheel Hubs, Spacer Rings and Motor Speed Pulleys. Cincinnati No.2 Misc Parts and Acces. Edwards mdl. M75- Gun Drilling Machine s/n 473 w/ 1140 and 1725 RPM Motors, 8” 3-Jaw Indexing Chuck, Eldorado Mega Machine Coolant Unit, 3-Axis 12” x 17” Fixture Table. Pehaka ROB 250SL 11” Automatic Hydraulic Horizontal Band Saw s/n 35992-077821 w/ Auto Feeds, Work Stop, Coolant. Superior mdl. SI-12kW 12kW – 15kVA Induction Heating Machine s/n S12KW0403 w/ IRtec Rayomatic-20 Infrared Thermal Controller, 600 Degree to 1600 Degree C Range, Dynaflux mdl. R2200 Cooling Unit, Heating Coils and Acces. 2006 Kaeser mdl. SM11 10Hp Rotary Air Compressor 42 CFM @ 110 PSIG s/n 1614 w/ Kaeser TA11 Refrigerated Air Dryer s/n 2330, 60 Gallon Air Storage Tank, 2603 Metered Hours. Hobart MEGA-MIG 450 Arc Welding Power Source s/n 81WS20996 w/ Hobart 27A Wire Feeder. Empire “Pro-Finish” mdl. PF-2636 Dry Blast Cabinet s/n 4889 w/ Dust Collector. Burr King mdl. 32 Vibra-Burr 32” x 12” Media Tumbler w/ New Liner, Media and Sound Enclosure. Everett “Sever-It” 10” Cutoff Saw. Ingersoll Rand 5Hp Horizontal Air Compressor. Kitagawa mdl. MR250RAE II 4th-Axis 10” Rotary Head w/ 9” 3-Jaw Chuck and Center. Sandvick “Silent Tools” mdls. 570-3C-32-544CR, 570-3C-40-688CR Rigid Boring Bars w/ Interchangeable Heads, Thru Coolant Feed. Edwards Large Diameter Gun Drill Sharpening Fixture.